Students at USU pass by sculptures on their way to class, participate in time-honored traditions such as standing on the Block A to kiss on True Aggie Night and play pranks on the pieces of artwork across campus. Some sculptures are rarely ever seen, and wait like gems to be found in hidden crevices of the university. Sally Stocker, a former development officer at the Nora Eccles Harrison Museum of Art, came to museum registrar Casey Allen last year with the idea of revamping the museum’s sculpture tour, which at the time was just a list of all the statuary on campus in a printed brochure. Most of the campus sculptures are outside, though a few, like the music-playing Dutch shoes, called Klompen, are indoors. The statues were divided up into four routes of varying lengths. Allen and Stocker then asked how far people could walk in the event. They teamed up with Dayna Barrett, interim director of the Wellness Center on campus, to measure the routes, which range from 1.25 to 3.76 miles in length, from a short walk to a lengthier stroll around campus. The shortest route, this one takes walkers around the southeast side of campus, from as far as the library to the fine arts buildings. Walkers start at Tilting Arc, a tall pair of steel windmill-like figures outside the museum walls. On a breezy day, the tops rotate around “like a silent dancer or a ship poised for a flight,” according to the paragraph written by Allen in the tour guide. Walkers then visit some of the university’s most famous pieces of artwork, including the “French Fry” statue. However, that is not the statue’s real name, Allen says. Its real name is SNAFU. Almost every winter, Allen explained, students build a giant hamburger out of snow next to the sculpture. Only some of the attention is positive, however. The bright yellow statue has garnered so much attention over the years that last summer, it was painted green as a prank. This winter, someone placed signs around the statue claiming the university was going to take it down, urging students to action by joining the Occufry USU Opinions group on Facebook. Eventually, amused museum officials explained they had no intentions of removing SNAFU. The 2.76-mile second route has a lot of the same statues as Route 1, but extends further north and west on campus. Newer statues include the Thai Prince Phra Apaimanee, cross-legged and playing a flute outside the Animal Science building. The prince is a fictional character from a Thailand folktale, according to Allen’s brochure. Across the Quad, the Block A sits quietly, waiting for use. Tourists and students occasionally stand atop the stool, but the block is best known for its use during True Aggie Night. This tradition was started in 1916, when students gathered at the top of the Old Main bell tower nearby to kiss under the full moon, thus making them True Aggies. However, because so many people were gathering on these nights, it became a fire hazard, and the Block A was built and placed on the grounds outside. Currently it sits on the northeast corner of Old Main, and those wanting to become True Aggies must kiss another who has already undergone the tradition under the full moon, or wait until Homecoming in the fall or A-Day in the spring. The third-longest route spreads all across campus to the stadium, where the Merlin J. Olsen Aggie All-American statue stands on a pedestal to greet people on their way inside the football stadium. Perhaps the most noticeable is “Meet the Challenge” across the street, a charging bull overlooking 800 East and 1000 North. “Of course, the ‘Meet the Challenge’ sculpture is the most popular because of all the traditions associated with the sculpture,” Allen said. Traditions are often associated with the campus statues, and the bull is no different. Allen said one is the Aggie Stampede. During this event before a home football game, students rush around campus, pulling others out of their apartments, to join together at the bull. If visitors or students are looking for a tour of the entire USU campus, this route is right for them. Almost four miles long total and with 36 pieces of artwork, the walk can be done within two hours, according to Allen’s catalogue brochure. 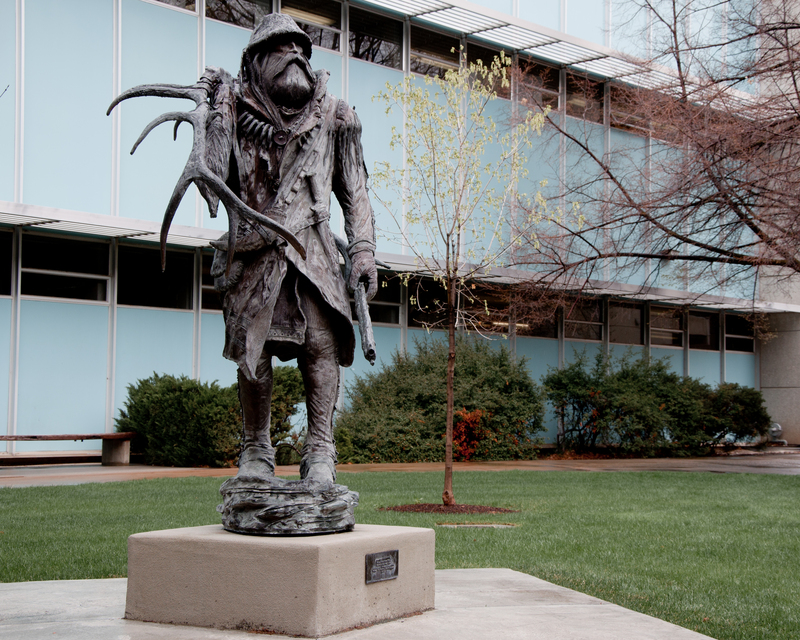 The striking Mountain Man statue is found in the courtyard next to the BNR. Students who were on campus before fall 2009 may remember that this statue used to be located outside the Natural Resources building. 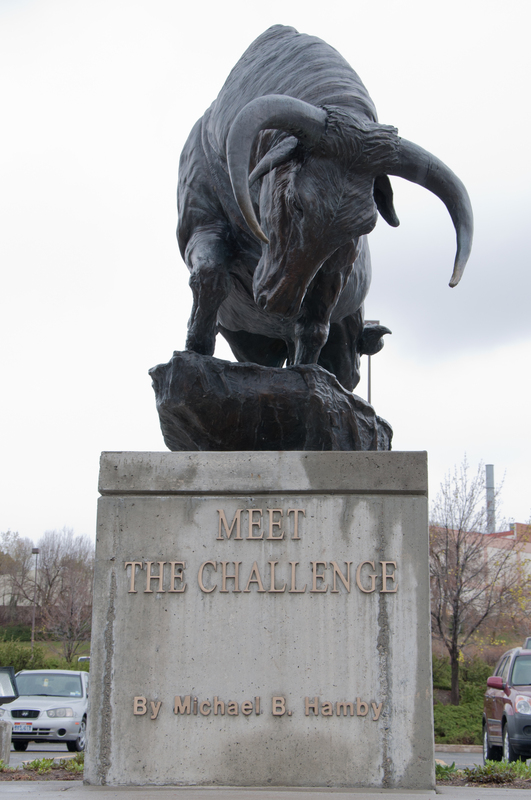 Created by Michael Hamby, who also constructed “Meet the Challenge,” the bronze statue of a mountain man was unofficially adopted by the College of Natural Resources as its leading symbol. If walkers turn to the Natural Resources building, they might find the college’s small library. Inside, in the middle of the floor sits what Allen called one of the lesser known statues on campus. 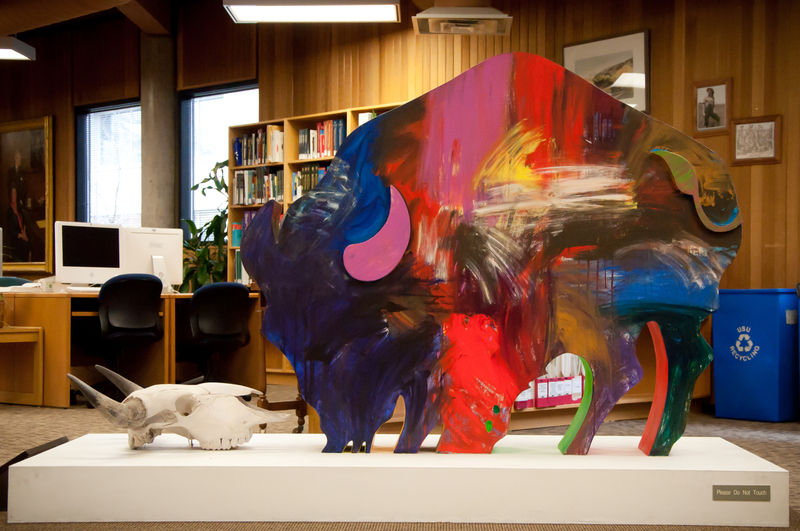 “Buffalo Contemplating His Own Mortality” shows a large multicolored buffalo staring down a real, sun-bleached buffalo skull. 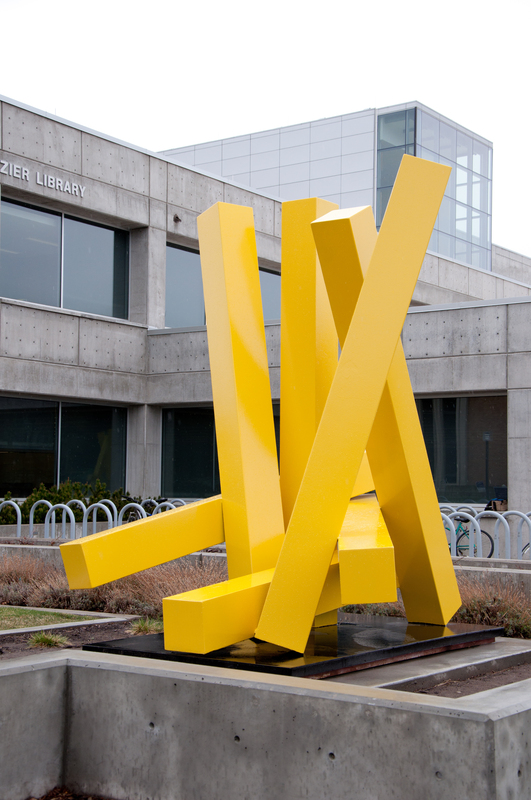 Allen speculates most students don’t know the sculpture exists because of its location. Stocker agreed the walk is a great activity for students, or even visitors to the university. “It’s fun and interesting,” she said, “something different to do on a date or family night. And part of the benefit is to get some exercise, while not really realizing you’re getting exercise.” Barrett, who works in the Wellness Center, has recommended the walk to people looking to switch up their exercise routine. “It’s good to change up your routine every once in a while, so you don’t get bored with the same route,” she explained.